Kings Island is one of the most popular regional amusement parks in the country—and with good reason. Highly regarded roller coasters such as Diamondback and The Beast, a great collection of family and kiddie rides, and other features keep the turnstiles clicking and the midways jammed. Its Soak City water park, which is included in the price of admission, is also great. However, when the mercury is soaring on sweaty, busy days, a lot of the visitors who would otherwise be riding coasters are instead jamming the water park. 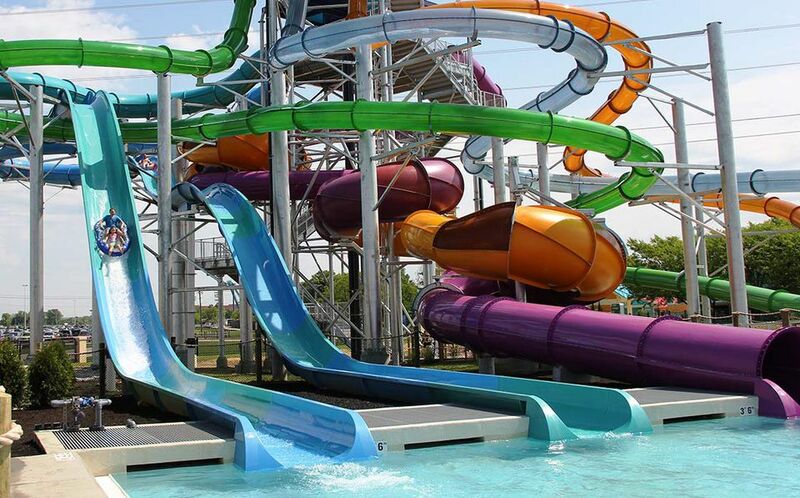 Soak City offers plenty of great slides and rides, but lines and wait times can swell. So, how could you and your park posse enjoy the heavy swells of the wave pool while avoiding swelling crowds? The general strategy (and this is true for visits to any water park or theme park) is to zag when everybody else is zigging. That is, you don't want to visit the water park when gazillions of other people would also be visiting. Don't, for example, arrive at Soak City on a blisteringly hot Fourth of July and expect to sashay right up to one of the water slides. It's likely that there will be wall-to-wall people. If you must visit on the weekend, arrive early when Soak City first opens and/or for the last couple of hours of its operation. During the middle of the day, enjoy the coasters at Kings Island. If the majority of visitors are at the water park, the lines would probably be less jammed on the “dry” rides. Better still: Arrive early or later in the day at the water park on a weekday instead of a weekend day. Consider visiting Soak City when it first opens for the season in the spring or towards the end of its operating calendar in the late summer. If you're a bit hearty, try to plan a visit to Soak City when the weather would be less than ideal. Forecasts of lower temperatures, overcast skies, and/or rain tends to keep visitors away. As a bonus, the crowds for the coasters and other Kings Island rides would likely be lower as well. Who knows? Maybe you'll luck out, and the weather will turn out great despite the forecast. If you absolutely have to visit on a hot weekend day or other busy time, you could avoid some of the crowds by purchasing the skip-the-lines program at Kings Island. The regular Fast Lane option, which requires an additional fee, does not work for any of the rides at Soak City (nor does it work for some of the more popular coasters). You'd have to spring for the premium Fast Lane Plus, which requires a hefty fee. Note that you could only skip the lines of select Soak City rides. You'd still have to face enormous crowds in the wave pools, Splash River, and other attractions. Rent a cabana. It wouldn't get you onto the slides any faster, but at least it would give you and a few of your park mates a relaxed place to hang out. Again, it's not a cheap option, but you wouldn't have to hunt for lounge chairs (which are often scarce on busy days). Plus, you'd have your own dining table and place to lock lock your valuables. And if you sprang for a premium cabana, you'd get a mini-fridge stocked with soft drinks, a TV, and other amenities. Why Should I Even Visit Soak City? There's a reason why the park is often packed. It's loaded with great attractions such as Tropical Plunge, a slide tower with launch chambers, speed slides, and s-curves. There are also two wave pools, the Pipeline Paradise, a FlowRider surfing ride, the Zoom Flume family raft ride, and the Mondo Monsoon funnel ride, as well as water activity areas and play areas for young children. Most folks have always referred to Soak City as "the water park at Kings Island," but it's actually had a number of official names. When the park first opened, it was known as "Waterworks." In 2004, then owner Paramount Parks rebranded it "Crocodile Dundee's Boomerang Bay" to tie in with the movie series. With the sale of Kings Island to park chain Cedar Fair in 2007, the new owners changed the name to simply Boomerang Bay. In 2012, Cedar Fair said "g'day" to the Australian theme and reverted to the more generic look and brand of its other Soak City locations. Soak City water park is included with admission to Kings Island. The park offers pay-one-price, all-day passes both at the gate and online (often at a reduced price). Discount tickets are available for seniors and children. Season passes and group sales are available. The park may offer discounted prices online. at its official Website. If the weather is really lousy, you could visit the indoor water park, Great Wolf Lodge at Kings Island. In fact, it is open year round. P!art of the Great Wolf chain, the lodge includes a hotel as well as a host of activities in addition to the indoor water park. Only registered guests of the hotel are admitted into the water park.